Pilot lights are the bane of many gas-powered appliance owners. 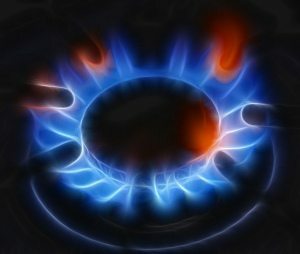 Right up there with electricity in the scary-and-dangerous department, gas is nevertheless an affordable and effective appliance fuel. Understanding the way the pilot light functions on stoves, water heaters and gas dryers will help increase your comfort level. In the event yours goes out, knowing how to reignite it can prevent a dangerous buildup of natural gas fumes. Here a few basic facts about pilot lights and how they keep your gas appliances working. Your gas stove typically has three or four individual pilot lights: one each for oven and wood boiler (or one that serves both) and two for stovetop burners (one left and one right). Every range model is different, but there are some general guidelines. Gas range tops are usually hinged, allowing you to lift them up from the front. The pilot resides between the front and back burner, maintaining a small, steady, blue flame. If you smell gas in the kitchen, check these first, as they can often go out from a gust of wind or overrun cooking pot. Raise the top and allow the area to air out for a few minutes. Use a long utility lighter or match, placed just at the location of the pilot hole, to relight. For the oven and broiler, things get a little more dicey. They have different configurations, so consult your owner’s manual to learn how to relight. Often the pilot hole is located at the base of the broiler compartment. Light this the same way as described for the burners. Water-heater pilots almost universally reside at the bottom of the unit. If yours goes out, it may indicate a problem with the thermocouple or other component, requiring a professional service call. You can make an attempt to relight, but if it goes back out again, turn off the gas to the heater and contact a professional. Ditto if you smell a strong odor of natural gas. Follow manufacturer’s instructions, but generally the steps are as follows: turn the gas off and let the area air out for 10 minutes. Clean the area thoroughly underneath the heater, including air vents and filters if your unit has them. Turn the temperature setting to low and the on/off switch to “pilot.” Press the pilot button down and hold it. As you’re holding the button down, press the igniter switch until it clicks and the pilot flame appears. Turn the on/off switch to “on,” then set the temperature to your liking. If your dryer was made in 1994 or later, it does not have a pilot light, it uses electronic ignition instead. If your dryer is older than this and not producing heat when it runs, contact a qualified appliance-repair company to troubleshoot the problem. Pilot lights on old dryers are difficult to access without special tools and technical knowledge. For any gas appliance, it’s always wise (and safer) to consult with a professional. Complete Appliance Repair in Salt Lake City has extensive experience with gas appliances of all types. They excel in the care of older appliances too, keeping them running like new. Trust them for all your appliance needs, including negotiating the pilot lights on your gas appliances. This entry was posted in Blog and tagged Gas Appliance Maintenance, Gas Appliance Tips, Negotiating Pilot Lights on December 2, 2014 by admin.